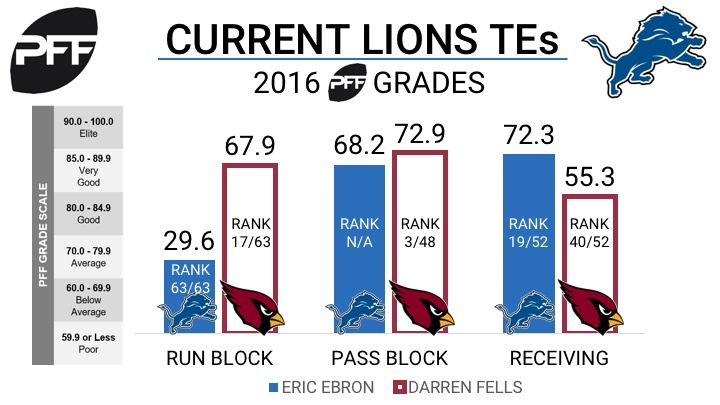 Detroit Lions OC Jim Bob Cooter is expecting to use more two tight end sets in 2017 after adding TE Darren Fells this offseason. Fells has played the last three seasons with the Arizona Cardinals. Cooter and the Lions went with two tight ends on 12 percent of their plays last year, while the average NFL team used two tight ends 23 percent of the time. In 2016, Fells finished with a grade of 65.4, ranking 31st of 63 qualifying tight ends. The mark was 12 points higher than his grade from the 2015 season. Fells graded as the 17th best run blocker of the qualifying tight ends last year, with a grade of 67.9. Additionally, Fells’ pass blocking grade ranked third in the group (72.9).